The whale watching boats have sure had a good week, the chinook anglers not so much. There seems to be orcas working the North Arm to the South Arm of the Fraser pretty much every other day with numerous pods spotted all week. Without a doubt this affects the chinook fishing and as a result we have had some lackluster days in-between some good days. As mentioned in last week’s report, if you are out there when a school of chinook shows up on the flood tide off the Fraser mouth area and the whales aren’t around, then fishing has been pretty good. Then of course there are the seals, they have been aggressive this year and have taken a number of fish from our boats this past week. Despite the orcas and the seals, there have been some nice chinook caught and we are starting to see some big ones. For the most part we are still getting the red springs in the 10 to 20 pound class but more and more of the white springs are starting to show up. This trend will continue as more whites show up in the first week or two of September and the red springs finish off for the year. These white springs are generally headed for the Harrison River and Chilliwack/Vedder River. There are plenty of 30 plus pound fish that enter these rivers each fall so if you want your shot at a local tyee, now is the time to start fishing the T-10 and South Arm for these fish. We don’t seem to get as many of them off the North Arm or Bell Buoy as most of them seem to head up the South Arm, so if you have the time to book a longer charter, or the winds allow the run down S, this is what we recommend for the next 2 weeks. Productive depths on the downriggers for chinook in the Bell Buoy, North Arm, T-10, and South Arm have been 30-80 with the 60-70 zone being the best lately. As usual, bait has been the most productive. A mix of herring or anchovies in a glow teaser head with some green, chartreuse or blue has been producing. For more information on flashers and teaser head choices, visit last week’s report where I went in depth on this subject and provided pictures as well. On our shallower rods we have been hitting some nice coho. The coho along the entire coast seem to be above average size this year. There aren’t a lot, so it doesn’t look like it will be a banner fall for coho, but the ones we are getting are in extremely good shape and big! There have been a mix of hatchery and wild coho and expect to see more of coho show up next week as the numbers always build throughout September. This prime wild coho was caught at 30 feet on the rigger at T-10, and was released with care. 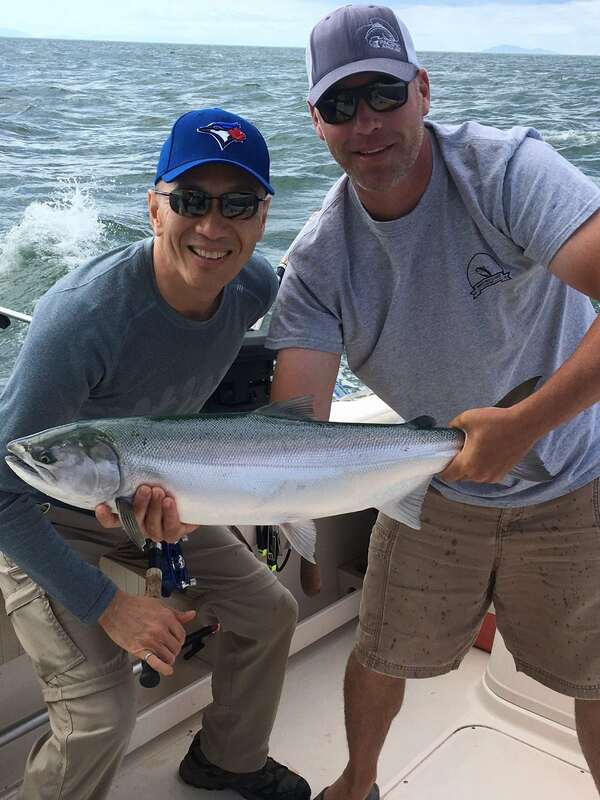 This large hatchery coho was caught at 25 feet on the rigger at Point Atkinson. It has also been good to see Department of Fisheries Conservation & Protection staff out these past weeks. 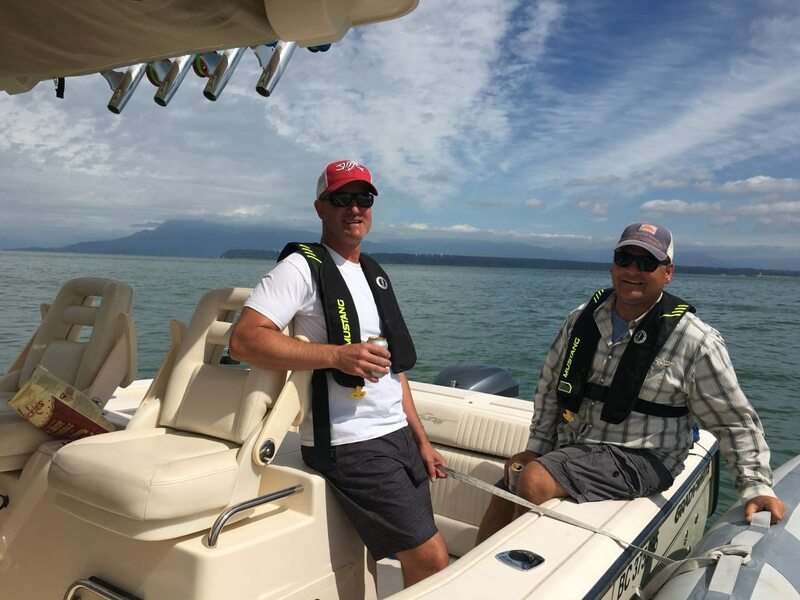 They have been out in the zodiac patrolling all the local fishing spots, in particular the North Arm to South Arm area, so make sure you are outside of the closed area, your barbs are pinched, and you are fishing for chinook and hatchery coho. All wild coho and sockeye must be released with care. 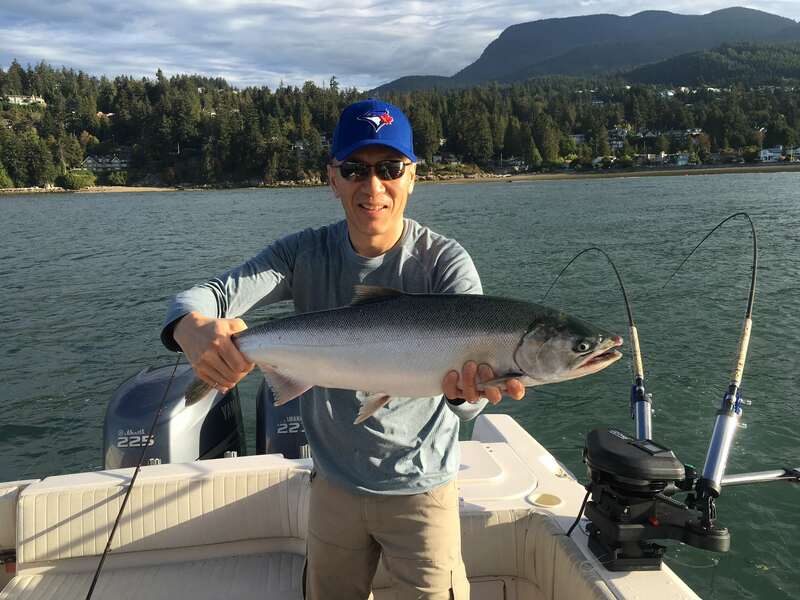 Fall is a great time to be a fisherman around Vancouver and we sometimes forget about it with the bustle to get kids back in school and getting back into work routines after the summer break. From as early as the second week of September into November the major runs of white chinook, coho, and chum salmon will be hitting our local waters. Lake fishing is awesome in September and the trout streams are also a great option as fish are fattening up for the winter. So we thought what better time to offer great savings to get you equipped for the next 3 months on the water! Mark the weekend of September 16th, 17th, and 18th on your calendars. EVERYTHING WILL BE ON SALE – with huge savings on waders, rods, reels, fly tying materials and saltwater gear. More details will be coming in the next several weeks so be sure to check your inboxes.